Jake Farrell at the plate for Northeastern in the NCAA Raleigh Regional game June 2 against North Carolina State. 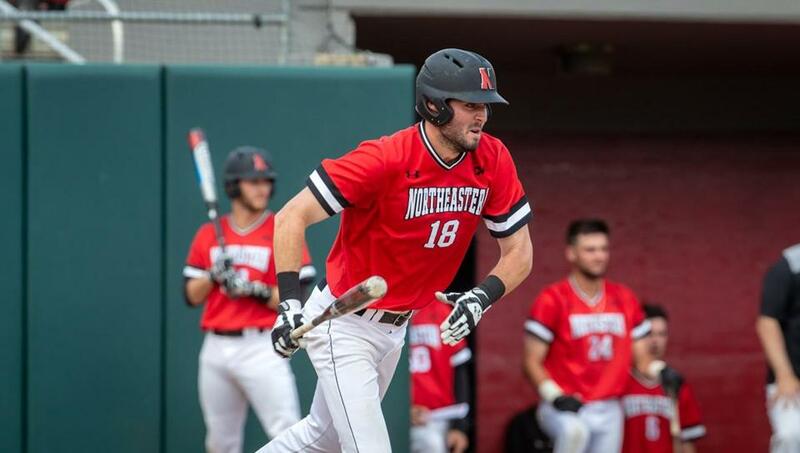 Jake Farrell had a breakout season for the Northeastern University baseball team. After missing most of last season with a hamstring injury, the Westwood resident made a major impact in his junior year for NU – leading the team in home runs (11), triples (8), doubles (16), and RBI’s (63). With 142 total bases, Farrell broke Mike Lyon’s single-season program record of 138 set during the 2008 season. Farrell, the winningest quarterback in Xaverian Brothers’ history, led NU to a 36-21 record. He had a five-hit, six-RBI game in a 23-6 win over Towson, and strung together a pair of 11-game hitting streaks. This summer Farrell plans to play for the Plymouth Pilgrims in the New England Collegiate Baseball League. Q. How was the experience of making the NCAA Regional? A. We had a great year, and obviously going down there and not getting a win to get out of the regional was tough. But we played two really good teams. It was great to see the success we had together and to get to the regional for the first time in quite some time. I’d say the season was a success. Q. Anything behind the strong offensive season you put together? A. It was a good year for me. I was just trying to keep my head down and put the team in the best position to win games, and that’s what we did. When you get a good group of guys like this, it makes for something really special. Q. Did your injury play into this year’s performance? A. Coming off a rough year where I didn’t play that much, I guess I maybe had a chip on my shoulder this year. That and I wanted to play well for my teammates to put them in a position to win. It didn’t work out for me last year. Things were different this season. Q. You grew up a Red Sox fan. Do you have a favorite player? A. That’s tough, but I’d go with Andrew Benintendi. We’re both lefties and I guess you could say our games are similar, although he’s an outfielder. I just like the way he plays the game, along with Mookie [Betts]. I met Benintendi in Florida and we talked some at first base, and I got a picture. He’s a really nice guy. Q. You had a monster game against Towson. Were you seeing the ball extra well that day? A. I’m not really sure. Baseball is a sport with a lot of ups and downs and that was an up day for me. You definitely have your good days and your bad days and just hope there are way more good days. Q. Do you have a role model in life? A. I’d say my dad [Billy]. We’re both sports guys, and he always tries to point me in the right direction and help me to make all the right decisions. John Johnson can be reached at jjohnson49@comcast.net.